The NN-14 blaster that Rey got from Han Solo! With these words Han Solo Rey gives an NN-14 Blaster to Rey after they have landed in "The Force Awakens" on the planet Takodana. If you're not only a Nerf fan but also a Star Wars fan, you need "this" in any case! 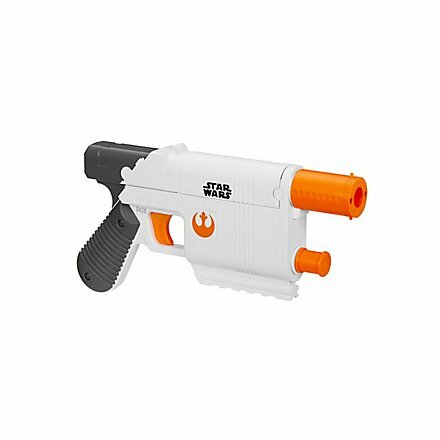 The Nerf version of Reys Blaster from "The Force Awakens"
As with the Nerf Han Solo Blaster, the Nerf Star Wars Rey Blaster is designed very close to the movie template. Very Hasbro-typical is the case very detailed designed: Just like Reys Blaster in the film, the typical grooves and screws can also be found here. Only in the rear part of the blaster a compromise had to be found with regard to design in order to be able to accommodate the mechanics inside. This compromise was quite successful, because with this slight change the Blaster is capable of more than just one shot. If three darts miss their target, trust in the power and use the fourth! Because apart from the mad optics the Blaster convinces also by an inserted magazine for four Darts.